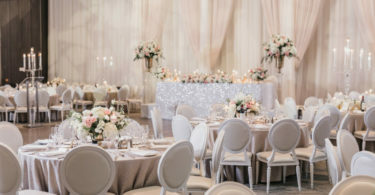 Ontario’s spectacular Niagara Falls was where Nadine and Krish celebrated both a traditional Indian wedding ceremony and a soft blush and gold reception decorated by Gala Decor Wedding & Event Design and captured by Gemini Photography. For the outdoor ceremony overlooking the falls, groomsmen wore traditional kurtas and bridesmaids wore sarees, seamlessly matching the bright fuchsia and orange drapes of the ceremonial mandap. For the reception, gold chiavari chairs and candleholders were paired with pops of sequins in the linens, while gold mercury glasses met with a mass of hydrangeas, roses, mums and peonies in the centrepieces. To add some drama to the scene, a double ivory backdrop with tufted diamond boards was set with stunning gold chandeliers for lighting. As for the delectable sweet table, glitter doughnuts, white chocolate dipped Oreo’s, and the bride’s favourite, Battenberg cake, were among the many treats served. 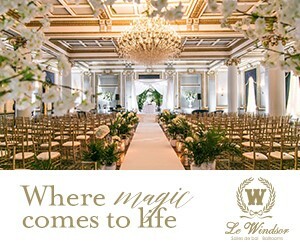 Find this wedding in the current issue of Toronto’s Elegant Wedding Magazine on stands now.